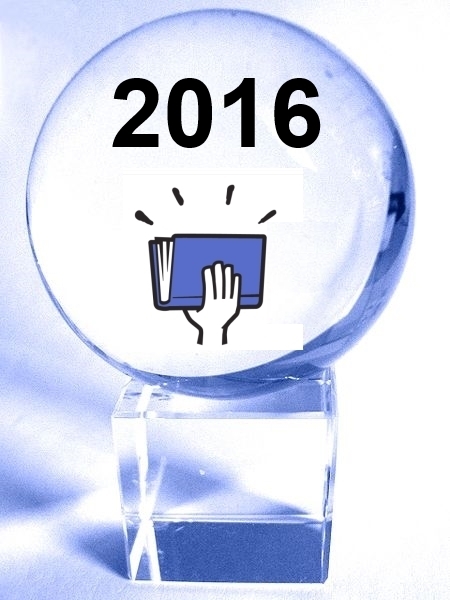 Each year I write an annual Smashwords year in review and then preview what's coming for the new year. Welcome to the 2015/2016 edition! Smashwords is focused on the long term. Although we've been in business for almost eight years, we still feel like we've only begun to scratch the surface of what's possible. We're looking ten years ahead and laying the groundwork today to enable a better long term future for the constituencies we serve - authors, publishers, retailers, libraries, readers, and book culture. A quick introduction for the thousands of authors and publishers who are new to Smashwords this year: I founded the company in 2008 to make it fast, free and easy for any writer, anywhere in the world, to self-publish an ebook. In 2009 we began distributing our books to major retailers starting with Barnes & Noble. Today we've grown to become the world's largest distributor of self-published ebooks. Over the years we've opened up exciting new sales channels for indie authors and small indie publishers that were previously inaccessible or didn't exist. Smashwords tools help you manage the complex digital logistics of ebook distribution from a single console. These tools help you publish and distribute with greater pride, professionalism and success. We've developed an amazing global distribution network backed by strong relationships with great partners that help put your books in front of more readers than ever before. A mere eight years ago, back in the dark ages of publishing and before the advent of Smashwords, publishing was a print-centric business where print accounted for 99.5% of book sales. A few large gatekeeper publishers in New York controlled which writers could become authors, which books could be read by readers, and which books reached bookstores. Bookstores, constrained by limited physical shelf space, could only stock a small fraction of available books. Those print books were static objects. They rarely changed their form post-publication, and most new releases were quickly forced out of print to make way for the next batch of books. Contrast the conventional print book with today's self-published ebooks. Self-published ebooks are dynamic, living and immortal creatures, constantly evolving with new metadata, new cover images and new book content, as the author or publisher iterates to make their book more visible and more desirable to readers. Indie ebooks never go out of print. Ebook stores will stock them forever. Ebook self-publishing has transformed publishing for the better. Thanks to ebook publishing platforms such as Smashwords and the retailers and library partners who have embraced indie ebooks with a passion, every writer in the world now has the freedom to publish and the freedom to be discovered, read and judged by their readers. Readers are the new gatekeepers. The good news for indie authors and the small indie presses we serve is that the transformation is still in its infancy. Indies are capturing market share. Few in the traditional publishing industry appreciate the revolutionary changes yet to come thanks to self publishing. Indie authors know what's coming, as do our retailers and library partners. They see that every year, more and more readers are turning to self-published ebooks. Most readers don't know or care if a book is self published. They want a great read and a fair price. Indies are publishing great reads at great prices. At Smashwords, we work for you. Unlike publishing services that earn income selling expensive services and packages to authors, we don't sell anything other than ebooks. I designed the Smashwords business model so our interests are 100% aligned with the interests of our authors, publishers, retailers, and library partners. If we help you connect books to readers then we earn a small commission and a seat at your table. We're working to create competitive advantages for Smashwords authors and publishers. Every day we're asking ourselves how we can add more value so that you can be more successful distributing with us than without us. Here's a summary of noteworthy events and milestones of interest to the Smashwords community in 2015. 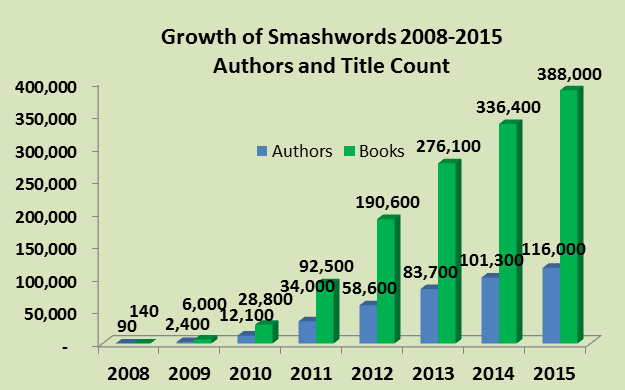 Expanded global distribution - Smashwords expanded the reach of our global distribution network in 2015. In October we announced a deal with Gardners which will deliver our books to over 2,000 public and academic libraries, and to over 400 small ebooks stores powered by Gardners. 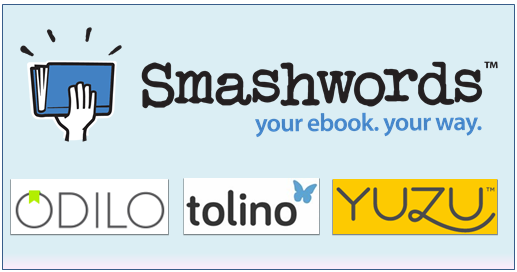 Earlier this month we added three new distribution partners with Odilo, Tolino and Yuzu, further expanding the global reach of Smashwords titles in North America, South America and Europe. These last three partners improve our reach to libraries, retailers and college bookstores. Assetless preorders - In June we announced assetless preorders, our most ambitious new feature since we launched Smashwords in 2008. It was an enormous technical undertaking that involved our entire engineering team and over one year of beta testing and development. It couldn't have happened without the close collaboration and support of our awesome retailer partners, especially iBooks, Barnes & Noble and Kobo. It was a pretty radical idea to give self-published writers the ability to establish preorder listings up to 12 months in advance, even though the retailer had no assurance that the author would deliver the book on time. We developed flexible policies and systems to automatically help authors meet deadlines, or to modify onsale dates as needed. Suffice it to say the new assetless preorder capability has reaped incredible results for many of our authors. If you don't have your next 12 months of book releases up on assetless preorder today, do yourself a favor and make it happen ASAP. As we found in the 2015 Smashwords Survey, books born as preorders earn more sales than books uploaded the day of release. The longer preorder runway enabled by assetless gives you additional time to market your book and accumulate orders. To learn how to make assetless preorders work for you, check out the links to my various blog posts, articles and best practices training materials at the Smashwords Preorder page. Faster shipments - In support of the assetless preorder launch, we redesigned our shipment systems, and as a result our shipments are faster and more reliable than ever. For iBooks, we're now shipping continuously 24X7 and it's not uncommon for our books or metadata updates to appear in their store within an hour of shipment. For Kobo, we now provide them hourly shipments 24X7. For Barnes & Noble, we still ship once daily on business days, but thanks to improvements on their end, they're now listing our books and preorders faster than ever, usually within about 30 hours of our delivery. Thank you retail partners! Better alerting on book status - In May we introduced automated email notifications that alert you the moment your books are reviewed for Premium Catalog distribution, which means you're immediately aware of status and next steps. In October we introduced a new monthly alert to help you identify books that are awaiting modification prior to distribution. Combined, these two tools help authors and publishers obtain full distribution as quickly as possible. Widgets - This summer we released Smashwords Widgets. This new tool makes it easy for you and your readers to build attractive and dynamic book promotion widgets for placement on blogs and web sites. The widgets are customizable. To utilize our widget builder for your books, click to any book page, then click the "Create Widget" link below the shopping cart. Or, click here to play with the widgets now for the Smashwords Book Marketing Guide. Improved retailer merchandising for Smashwords authors and publishers - For many years now, we've worked behind the scenes with our retailers to help them identify great Smashwords titles that are worthy of merchandising love on their store's home page. 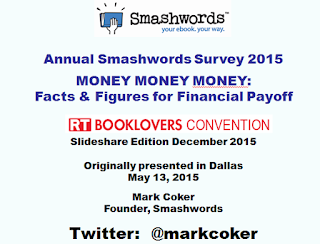 Hundreds, if not thousands of Smashwords authors have benefited from these efforts. For the last two years, we've provided iBooks weekly "hot lists" of our top-performing titles as well as other titles we think deserve merchandising love based on the author's track record or performance at other Smashwords retailers. In 2015 we began delivering customized hot lists to the merchandising teams of Barnes & Noble and Kobo. In 2016 you'll see us continue to enhance our ability to help retailers identify the titles that merit additional feature love. The best thing about our merchandising support is that it's entirely merit-based. Leveraging our unique vantage point as your distributor, we can track audited sales and preorders (iBooks and Kobo) across multiple retailers so we can surface titles and authors we know will please readers and perform well if given additional love. For example, if your book is performing well at iBooks but hasn't been discovered yet by readers at Barnes & Noble and Kobo, your strong iBooks performance alone could get your book surfaced and recommended to the merchandising managers at the other retailers. Or let's say you're having a huge breakout at Kobo, which is a smaller retailer than iBooks and Barnes & Noble. Your success at Kobo can increase your visibility to the merchandising teams at iBooks and B&N. 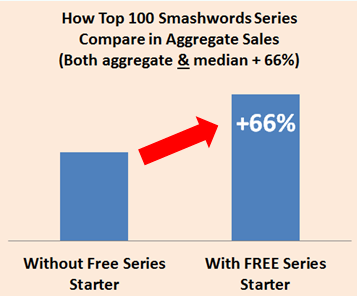 It's yet another reason to consolidate your distribution with Smashwords! More free best practices resources - As I mentioned in my 2016 Publishing Predictions post last week, an author's ability to implement best practices is what separates the strong sellers from the poor sellers. Best practices implementation isn't a static, one-time activity. Instead, we view best practices as a continuous approach to publishing in which you're ever-evolving and always working to do everything better. Better covers, better books, better book descriptions, etc. Best practices are the great equalizers of the publishing world. Every indie author has the opportunity to implement dozens of best practices. Each best practice, well-implemented, gives you an incremental competitive advantage for discoverability and sales. We invest a lot of effort each year to light your path. Whether its Jim Azevedo (our marketing director) or myself teaching classes at writers conferences, libraries or in online webinars, or through my writings here on the blog or my free ebooks (The Secrets to Ebook Publishing Success and The Smashwords Book Marketing Guide) and elsewhere, we teach you how to implement best practices. In July I presented a six-hour ebook publishing intensive at the Pacific Northwest Writers Conference. Following the conference, I posted the complete slides with additional annotations of the presentation here on the blog in a post titled, How to Publish Ebooks. In it you'll find an introduction to ebook publishing; a summary of 16 of the most important best practices; a guide to ebook preorder strategy; and a guide to iBooks merchandising (much of what I teach about iBooks merchandising will help you maximize your chances of getting merchandising love at other retailers as well). The slide deck of 283 slides has already been viewed over 25,000 times. For a good collection of links to the best of our best practices training materials, visit the How to Publish and Distribute with Smashwords page and scroll down to section at the bottom labeled, "Great Resources to Help You Publish Like a Pro." Daily sales chart improved - Back in June 2014 we introduced a cool new Dashboard sales reporting feature called Daily Sales that allows authors to view attractive same day and next day sales charts across multiple retailers and OverDrive. The tool originally provided 30 days of historical trending information. In 2015 we enhanced the charts to go to 90 days, and then a few months back we extended it to 180 days. By mid-year 2016 the charts will capture 12 months. Enhanced metadata - Metadata is the data about your book (such as price, description, category) that helps retailers make your book discoverable to readers. In March we added support for a couple dozen more book categories, and in May we added an option for authors and publishers to tag their books as box sets. This latter feature, although not adopted by retailers, has helped dozens of box sets and their hundreds of contributing authors receive extra merchandising love at retailers. For example, if a retailer asks us to provide them a list of the 20 top-selling romance box sets published over the last six months priced over $4.99, we can provide them that list, and it's entirely enabled by this new metadata option. If you have published a box set, learn how to add this enhanced metadata here or if you're new to box sets and want to learn how you can collaborate with fellow authors on a box set, check out my blog post titled, How to Do Box Sets at Smashwords for Audience Building, Charity and Profits. Improvements at the Smashwords Store - Smashwords is somewhat unusual in that we operate a small ebook store. Our store is a vestige of our early days in 2008 before we became a full-fledged ebook distributor. Although our store accounts for only a small fraction of our authors' sales, many readers prefer to shop at the store because one purchase gets them multi-format, DRM-free access to their book, and the store is accessible to customers worldwide. In 2015 we made a number of improvements to the Smashwords Store to facilitate improved book discovery. We introduced a new search engine for faster and more robust search results; added support for automated suggestions to appear as you're typing out your search query; and added intelligent context-sensitive book recommendations on book pages that go beyond the conventional "people who bought this also bought this" algorithms. These are labeled our "Readers of This Book Also Read" recommendations. On book pages we also added "Related categories" links to facilitate deeper drill-downs into adjacent categories. Pre-emptive opt-outs - Most Smashwords authors tell us they appreciate our policy of automatically opting their books in to new Smashwords sales channels. In fact, it's a service promise we make in the Smashwords Terms of Service. However, to accommodate authors and publishers that don't want their books automatically shipped to new channels, we introduced a preemptive opt out feature which you'll find at the bottom of the Channel Manager page. Books published - Smashwords now publishes 388,100 books, up 15% from 336,400 this same time last year. 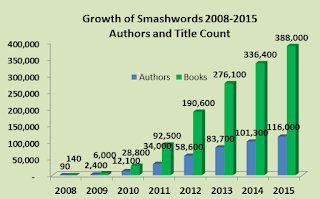 Words published - Smashwords now publishes a 14 billion words (we hit this milestone today!! ), up about 2 billion words from the same time last year. Authors/pen names published - Smashwords now works with over 116,000 authors and small independent presses, up from about 100,000 a year ago. Profitability - 2015 will be our fifth consecutive year of profitability. Profitability matters because it means we'll be around in the future to serve you. We've got a solid, debt-free balance sheet giving us the freedom to weather the inevitable ups and downs of a cyclical market. Dearly departed retail partners - In all competitive markets, it's to be expected that some players will succeed while other fail. In 2015 a couple notable Smashwords sales outlets faltered. Txtr, a small European retailer, went bankrupt. Its assets were purchased by Media-Saturn, a large German consumer electronics retailer that plans to leverage the technology to launch an ebook offering some time in 2016. In late August we announced that our relationship with Indian retailer Flipkart was ending after a nearly two-year run, and then a couple weeks later they announced they were exiting the ebook market entirely. I recently learned that Kobo is acquiring Flipkart's ebook customer base. In September Oyster announced they were acquired by Google and would exit the ebook subscription business. Oyster will close in mid January. Amazon Author on April 1st - A few times over the years I've published an April Fool's prank on the blog. This year I wrote about Amazon Author, a fictious new service from Amazon that replaces authors with a system called Amazon Author, which creates machine-generated books. I knew the post was outlandish, but like all good satire, it was grounded in a few facts. I was surprised by the reaction. I heard from many authors who found it so believable they suffered a War of the Worlds moment where my ficticious story caused them to see their author dreams flash and crash before their eyes. My apologies to my loyal readers who felt this fiction hit too close to home. I think more than anything the reaction spoke to the legitimate concerns authors have about their long term ability to maintain their independence and value within this fast-changing world of publishing. It also spoke to the fears many authors have about Amazon. Is Amazon a benevolent player, or will their business strategy of disintermediation lead to a darker future where even authors are disintermediated? If you missed my fictional post, you can read it with a fresh set of eyes here: New Amazon Service Eliminates the Need for Authors. A publishing legend passes - In November Dan Poynter passed away. I consider Dan the father of modern day self publishing. He was great friend to me, to Smashwords, and to every indie author who had the privilege to meet him, to hear him speak or to read his books. As as we learned in the comments in to my tribute to Dan, he changed the lives of a lot of people. Read the post and the rememberances here (and if you were touched by Dan's work, please add your memories): Dan Poytner, The Father of Self Publishing, Passes Away. Thank you to the fine authors, publishers, retailers, and library partners that make our job possible. It was our honor to support you in 2015 and we look forward to many more years of service and partnership. To our authors and publishers, thank you for distributing with Smashwords. We realize you have multiple distribution options including direct uploads to retailers. When you consolidate your distribution with Smashwords, not only will you save time, gain more time for writing and benefit from the myriad service advantages we offer, but you're also supporting our ability to continue investing in innovations on behalf of the entire indie publishing community. Have a safe New Year's celebration and we look forward to working with you in 2016! Smashwords books will begin appearing on these new partners' platforms during the first quarter of 2016. Initial shipments to these partners will begin in early January. Smashwords authors who wish to opt out of any of these channels (not recommended!) may do so in their Dashboard's Channel Manager. Authors and publishers who have chosen to proactively opt out of new channels will not be able to reach these new partners unless they visit their Channel Manager and manually opt in. All other Smashwords authors and publishers will receive automatic distribution of their Premium Catalog titles to these new platforms, with the exception of erotica titles which are excluded from the the Odilo channel.